July already has had much better weather than June (apart from the thunderstorm which blew two of my families computers, even with surge protectors on). Hot, sunny days which has already meant one day at the beach and hours outside exploring and playing in the wonderful place that I call home. I’ve even started to develop a slight tan, which people who know me can tell you takes a very long time! 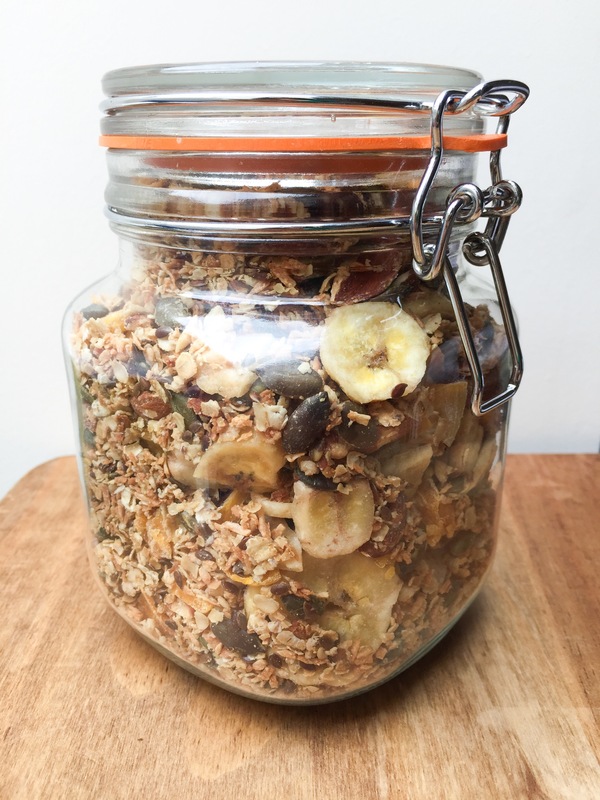 It has been six months since my last granola recipe so I thought I would share my new summer favourite. When I finished making this I had a tiny bit that wouldn’t fit into my kilner jar, so I put it in a pot on my kitchen table. My 4 year old nephew came running into my kitchen at lunchtime, saw it and instantly got a spoon and started eating it so not only a winner for adults but surprisingly for children too! Although he wasn’t as keen when he added milk, he preferred it dry as a snack. This is a lot sweeter than other granolas I make because of the quantity of dried fruit in it but they are natural sugars so much better than shop bought granolas. 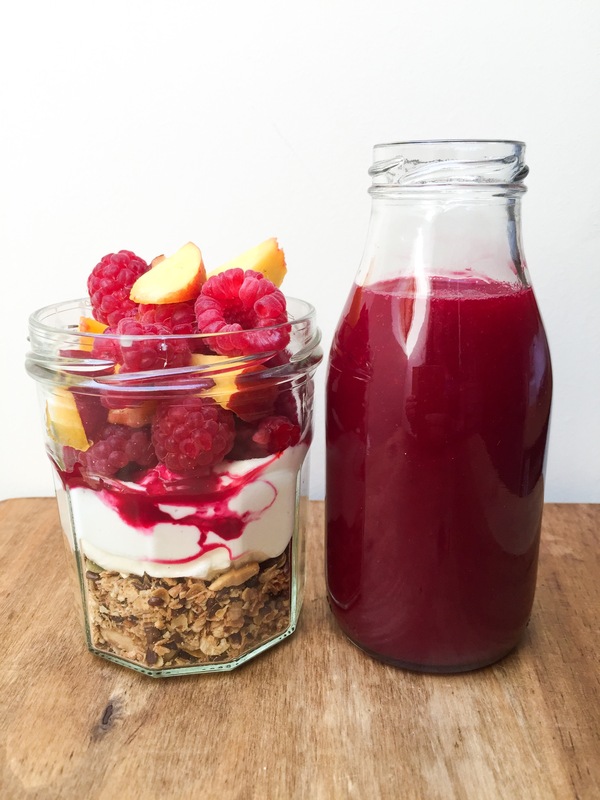 As it is sweet I enjoy it with plain yoghurt and fresh fruit or as a topping for my smoothie jars and bowls. The coconut gets wonderfully toasted in the oven which tastes great with the mango and banana. 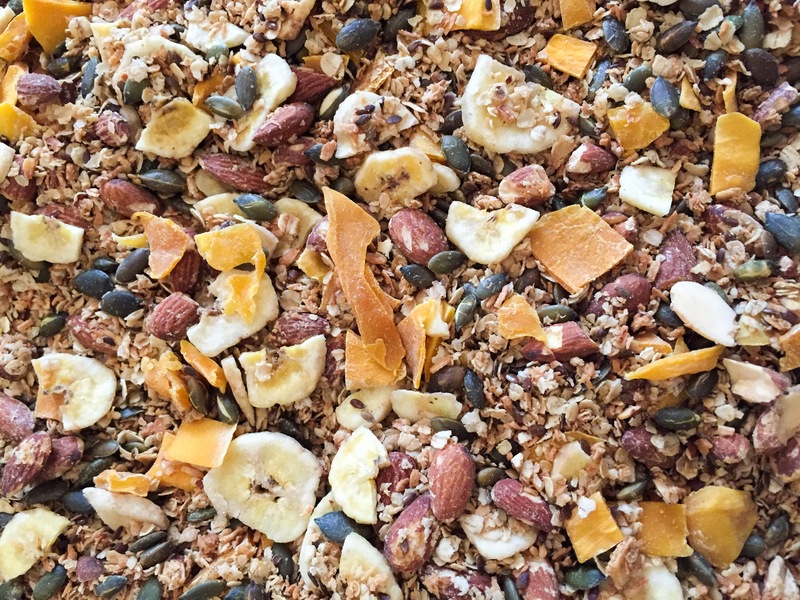 I’m not a fan of shop bought tropical granolas so I was really happy when I made this! 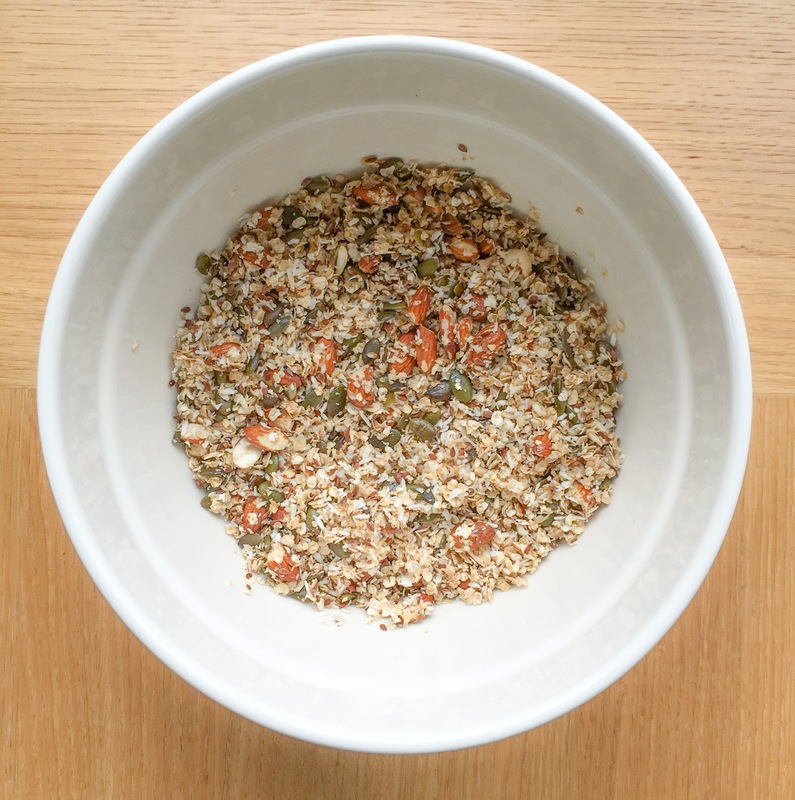 Place the almonds in a food processor and pulse for 10 seconds so they are partially chopped. Place the nuts in a large mixing bowl with the remaining dry ingredients, except the mango and bananas, and mix together. Melt the coconut oil with the maple syrup on a low heat in a saucepan on the stove. Once the coconut oil has melted add the sweet liquid to the dry ingredients and mix well. Place the mixture on a baking tray and bake for 30 minutes at 180C. It will need to be mixed regularly to ensure nothing burns and everything gets nicely toasted. Remove from the oven, allow to cool and then mix in the mango and banana. Store in an air-tight container to keep it crunchy.